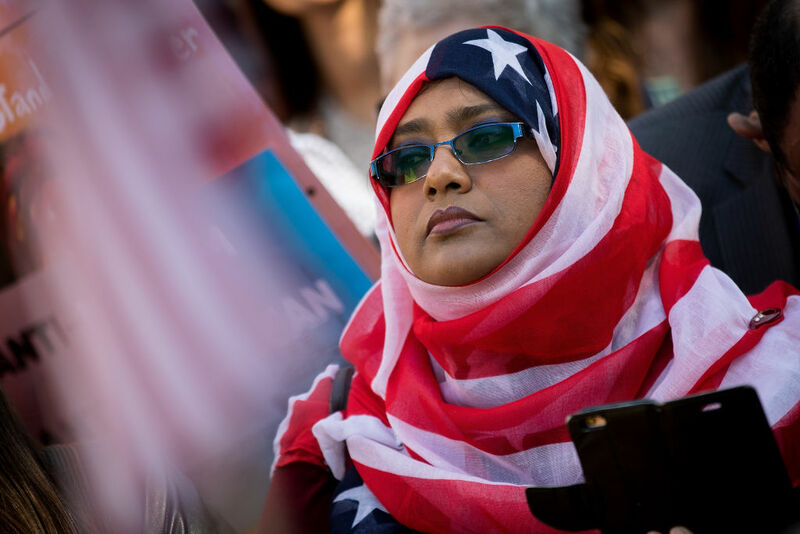 A woman wears an American flag themed hijab as she attends a protest against the Trump administration’s proposed travel ban on October 18, 2017 in Washington, D.C.
Americans now face a choice: Do we stand up for our highest values, treating others with dignity, fairness, and respect? Or do we succumb to bigotry and fear, allowing ourselves to be divided on the basis of faith or nation of origin? As an Iranian-American, this hits close to home. My husband, Maysam, came to this country from Iran in January 2000 through a student visa to get his PhD in electrical engineering at the University of Michigan. At the time, he had no family relationships with anyone in the United States. Eighteen years later, he is a professor at Georgia Tech. His research focuses on helping people with disabilities lead independent lives. One of Maysam’s inventions, the Tongue Drive System, aims to enable individuals with severe paralysis to operate their own wheelchairs or use a computer, all by moving their tongue. Had the Muslim ban been in effect at the time he was contemplating continuing his education, the opportunity to come to the U.S. and work on this innovative research may not have been available to him. (Though the newest version of the ban carves out an exception for Iranians seeking student visas, they would be subject to “enhanced screening and vetting requirements;” who can say what that would mean under this administration?) Those with serious illnesses and disabilities who rely on his research to ease their pain and improve their lives may have been deprived of the fruits of his work. My in-laws went through a rigorous process back in 2001—even before the September 11 attacks—to secure visas so they could attend our wedding. If a Muslim ban is ultimately implemented, as President Trump is trying to do, untold numbers of family members from Muslim countries will be denied the chance to see their American children, grandchildren, siblings, nieces, and nephews get married or graduate college. Trump’s proposal united our communities in opposition. Earlier this year in Atlanta, with less than a day’s notice, 7,000 people showed up to protest at the airport. Most of the protesters were not even directly impacted by the ban, but they rightly saw the policy as a threat against all of us. I found this show of support and solidarity heart-warming and affirming; one of our country’s strongest moments since Trump’s inauguration. This felt like a “bona fide relationship” in the truest sense—neighbors standing up for neighbors because of our common ideals. Despite the court rulings in our favor, Muslim travelers remain confused and intimidated. Rules for travel are changing all the time, and many travelers are still being stopped at the border due to racial profiling or arbitrary bureaucratic snafus. The rhetoric that led to the ban trickles down into administrative measures ranging from race-based TSA searches of travelers to arbitrary visa denials for those trying to enter the United States. Banning researchers and grandmas makes us no safer. Instead it damages our families, communities, and academic institutions. The Supreme Court must strike down this reprehensible ban once and for all, agreeing with the lower courts that such a ban amounts to nothing more than religious intolerance and racial animus. As Americans, we must continue to raise our voices and resoundingly reject any version of the Muslim ban. See you in the streets. Azadeh Shahshahani is the legal and advocacy director with Project South, a social justice organization based in Atlanta, and a past president of the National Lawyers Guild. She tweets at @ashahshahani.